Simply supported beams are defined as having two supports at either end – one pinned and one roller. This is generally considered as being the most simple type of beam. This is a very common type of beam and is considered determinant – as the beam can be solved using equilibrium equations. Cantilever Beams are supported from one end, using a Fixed Support. This is the only type of support that can be used in this scenario as it offers the moment resistance required for the beam to remain static. If a pinned or roller support was used, it would not offer the restraint that the beam would need. A good example of a cantilever beam is a shop awning – where the beam is bolted directly into the wall. Continuous beams are multi-spanned beams that have multiple supports across the length of the beam. An example of a continuous beam would be a single beam that is supported by a number of columns along its length. This is the only example between the support systems that is considered an indeterminate beam – since there are more unknowns than equilibrium equations available. 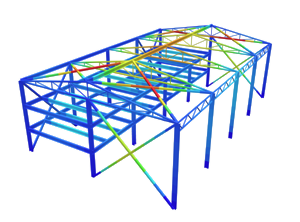 Fixed Beams have fixed supports at either end – offering moment resistance at either end. The bending moment within the member will generally have a value at either end of this beam. Overhanging beams are those with two supports, but unlike simply supported beams, one of the supports is not at the end of the member. A typical example of this is a balcony which is being extended from a frame structure. The frame offers the two supports, yet no support exists at the end of the member – allowing it to ‘overhang’ as the name suggests.